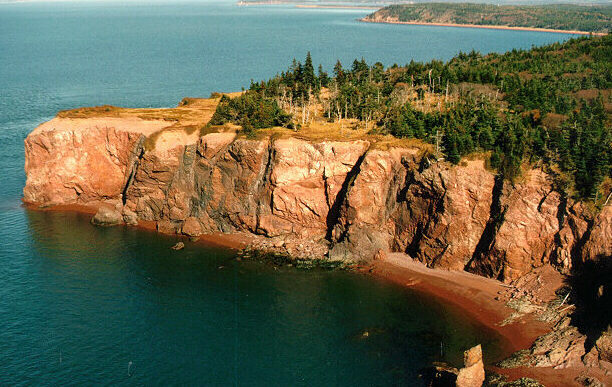 Squally Point near the head of the Bay of Fundy is the highest raised beach in Nova Scotia, nearly 40 m above mean sea level. The beach can be seen as a flat terrace without trees on top of the sheer volcanic cliff. Sea level was actually never this high. In fact the land was pushed down several hundred metres during the last ice age by the great weight of a 1 km thick glacier. When the glaciers melted 13,000 years ago the land rebounded, leaving this beach high and dry. 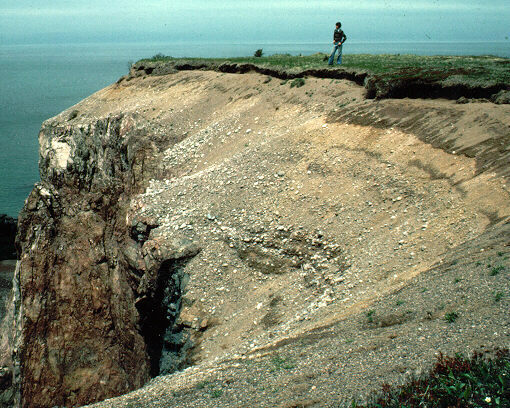 As we fly closer we can see the thick layer of well sorted sand and gravel on top of the bedrock, and if you look close enough a sea stack is visible on the terrace surface near the woods, representing the limit of the former shoreline. 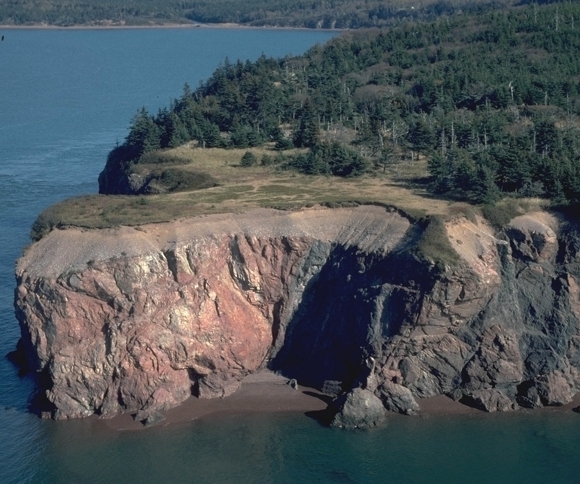 The cliffs under the beach are made of Early Carboniferous volcanic rocks formed when continents collided and Nova Scotia was created, 350 million years ago. For more info read Maass, 1992. No frisbee football allowed on this beach! Let's land! As we exit the chopper we can see well-rounded boulders at the base of the sandy beach sediments perched on the sheer volcanic cliff face. Let's do lunch! Fly to the finest example of eskers in the province of Nova Scotia: Vista of the Month 2.